What do I mean by “play in the tunnel” when moving laterally? This is my cue to remind athletes of the height I want them to move in laterally. When working with athletes on lateral shuffle technique the focus is to have them always stay low and push away- not to rise up and down. I often use a resisted technique to create artificial moment. The athletes are able to push hard, go less than full speed, and still “stay in the tunnel”. It works beautifully. 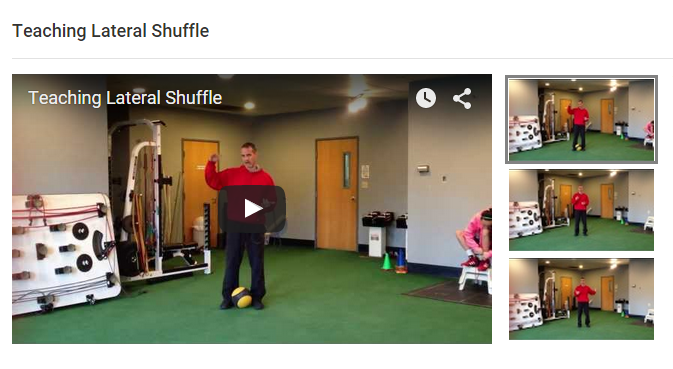 I may have the athletes perform two sets on each side at a slower pace, but with hard push offs and reset and push again (push hard for one shuffle, reset and push again for the second shuffle). They then will recover back under control working on deceleration with the resistance giving them artificial momentum by pulling them back in. After 2 sets of five repetitions, I will have them perform 2 sets on each side of three reps FULL SPEED! With this drill the athletes will stay low and drive the ground down and away. What occurs is the athletes grooved a pattern of staying low and push away under more control but still with artificial forces against them (the resistance). Then when they were able to do it full speed they moved so efficiently. Give it a try! Learn more about my techniques and methods in Ground Breaking 2.